Kedr Livanskiy swung through Toronto's Adelaide Hall on her North American tour last night (July 26), where she put on a clinic for how to work a dance floor. The line-up was rounded out by two local Toronto acts: Brahny, an effortlessly smooth R&B artist, and Kaade, a shimmering electronic producer and singer. Brahny's sensual style set the mood for the evening. His tranquil set, consisting of his warm vocals and downtempo beats, were enough to get the audience going. He was followed by Kaade who, despite her soundboard shutting down on her, seized an opportunity to restart the danceable, '90s synth-pop inspired tune "All the Air." Kaade's performance was energetic and her moves were enchanting. Her hypnotic set made it hard not to dance, and the crowd didn't hesitate to get down to it. 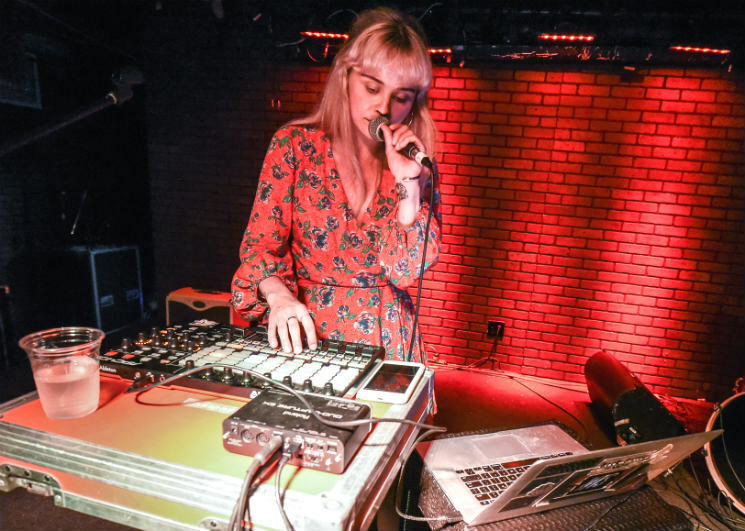 With just her laptop and soundboard, Kedr Livanskiy's no frills stage presence was more than enough to satisfy the audience. If one were only familiar with her music online, Livanskiy's set may come as something of a surprise; her dark, lo-fi electro-pop sound translates much differently live. Her progressive build-up of her repertoire kept things interesting, but she started slowly. Opening with "There Was a Time" gave the crowd the opportunity to adjust from the dance heavy jams of Kaade to something a little softer, as they descended into a dreamlike state. Crowd pleaser "Razushitelniy Krug (Destructive Cycle)" hyped up the audience like no other, the tunnel-vision techno sound imbuing the room with an intoxicating, rhythmic feel. "Ariadna" was performed twice, each one dynamic and unique from the other. She never lost that sweet synth sound, but the grainy, textured vocals made the experience jarring at moments. Livanskiy's stage banter was charming, as she spoke to the audience in Russian — for those who didn't speak the language, you could tell by her body language and alluring dance moves that she was having a great time. She ended her set with "Love & Cigarettes" which, despite not quite qualifying as a high-energy banger, formed a small mosh pit. It was raw and organic, and while one might not expect it from a laid-back, dreamy, synth pop show, there's mystery in Kedr Livanskiy's artistry.